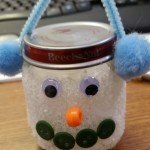 This cute baby food jar snowman craft is fun and easy for children of all ages. It makes a wonderful winter decoration for any home or classroom. Follow the step-by-step directions below. Step 1: Pour some white glue onto a paper plate. Let the children paint the glue onto the baby food jar. Step 2: Pour some white, sliver or a mixture of both glitter onto a paper plate. Let the children roll their jar into the glitter until the entire jar is covered in glitter. 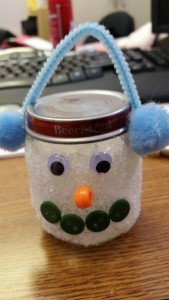 Step 3: Have the children decorate their snowman jars. They can use googly eyes, beads or pom-pom balls for the nose, buttons for the mouth, you can also use felt pieces for the eyes, nose, mouth or make a scarf and hat. I did reinforce some of the items the children glued on with a hot glue gun. Be creative and have fun!